I just wanted to share a few things I saw during the recent election (my post on the election itself is over at the Marmot's Hole). First up, we have pamphlets. The local government mails election pamphlets in a packet, which means that any candidate who can cover printing cost can get his propaganda to voters in the appropriate district. That would be a nice addition to American campaigns, IMHO. Also, I don't recall having seen any ads on TV. They may be illegal although, with strict campaign finance laws, they would be prohibitively expensive even if they were not illegal. There were 10-minute public service announcements for candidates for major offices during the two-week campaign period. 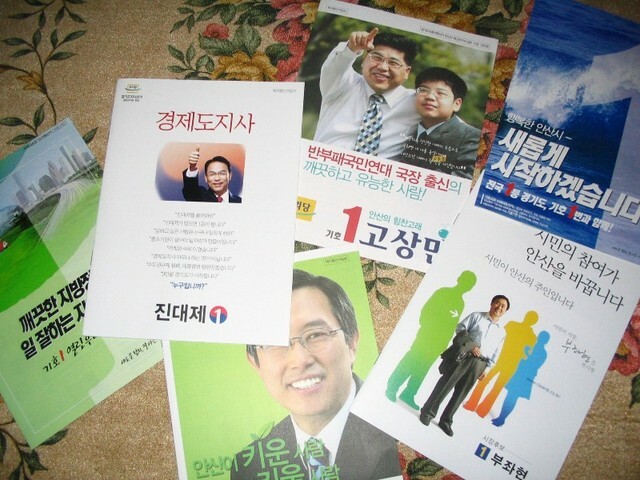 Anyway, here are some samples of the pamphlets Lady Yangban got in the mail. These are from Hannaradang or the Grand National Party (GNP). As you can see, the GNP's color is blue and its ballot number is 2. I believe that all the guys you see won as the GNP swept Ansan and Kim Moon-soo got the Gyeonggi-do governor's position. 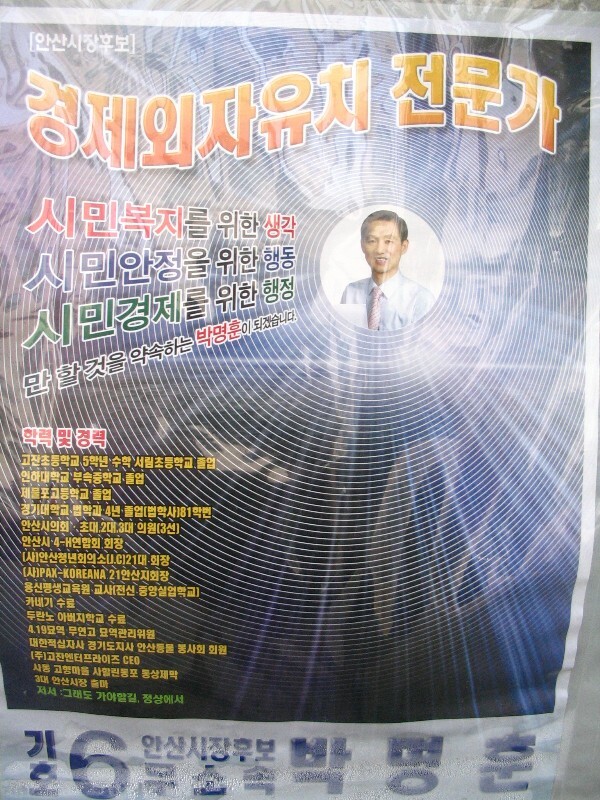 Here are pamphlets from the Uri Party (#1). Their traditional color is yellow, but you see very little yellow is these pamphlets. I suspect the party's low popular explains that. 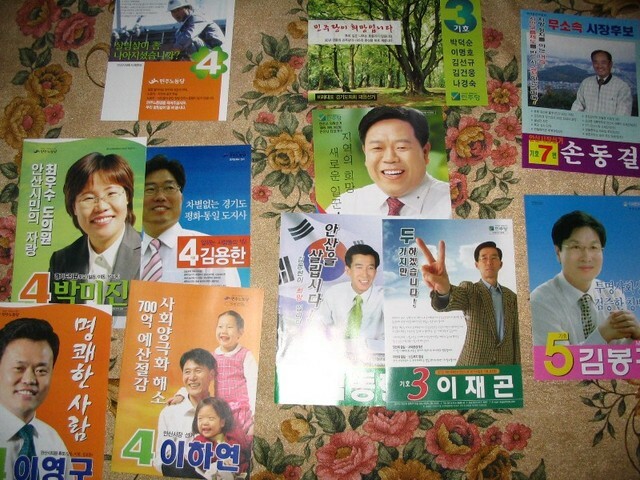 These are pamphlets from the Democratic Labor Party (#4, orange) and the Democratic party (#3, green). The two on the left are guys who ran for Mayor. 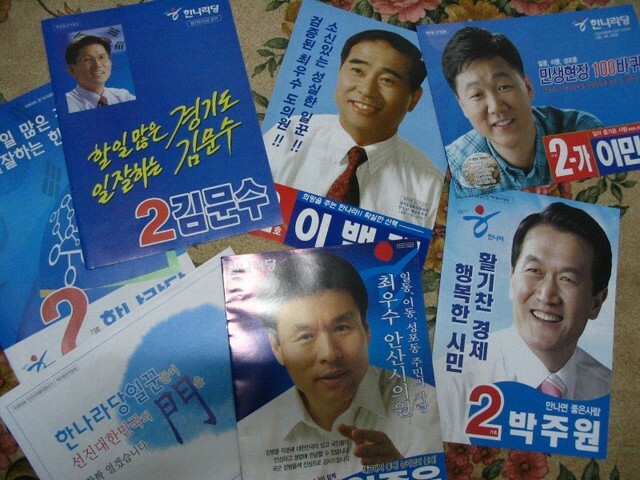 Mr Kim (#5) ran with the new People First Party while Son Dong-geol (#7) ran as an independent. As you may expect, Son's pamphlet was the thinnest of the mayoral candidates in the packet. Whoever was number six on the ballot apparently could not afford to print any pamphlets. 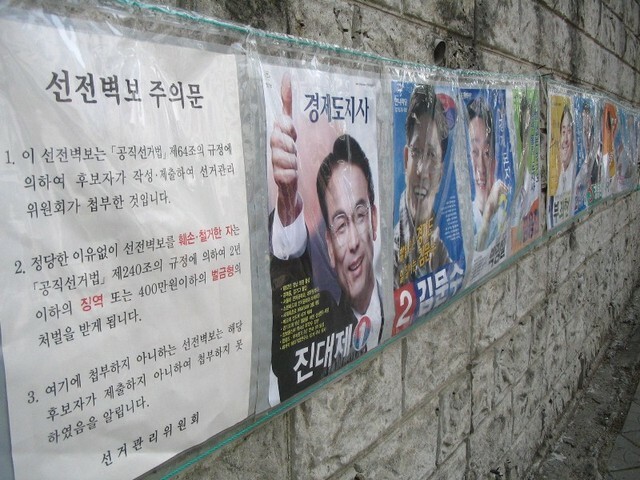 Banners like these were a common sight during the campaign. The short official campaign period made using billboards impractical. These posters where put up by the local government. This group included all the candidates for whom people in the local dong could vote. Anyone defacing or taking down any of the posters could be fined up to $4,000. 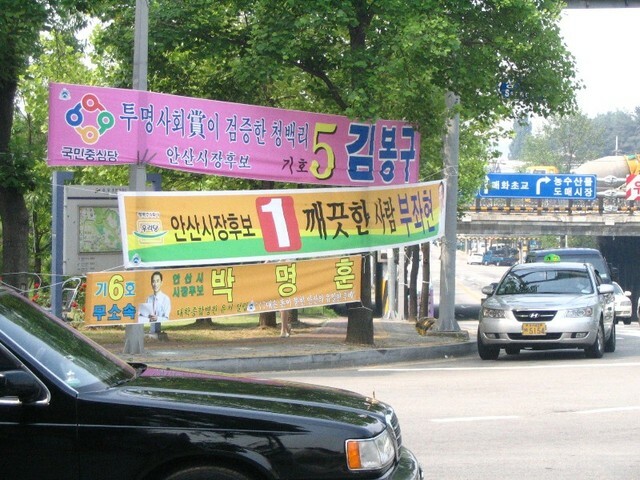 Yard signs are impractical for Korean campaigns since the short campaign period makes timely distribution a problem and (more importantly) most Koreans do not have yards. Here is Park Myeong-hun. The mysterious #6 who did not have a pamphlet. I guess he spent all his money on this supper-cool poster. And don't forget the tape-blasting campaign trucks. Here is another truck from the 2004 National Assembly campaign. The Uri Party was #3 that year, I presume because they have the third-largest delegation in the assembly.